Fresh data gathered by ad network Chitika shows Macs running Apple's OS X 10.10 Yosemite beta accounted for 0.2 percent of all OS X-based ad impressions in North America one month after release, nearly four times that of its predecessor OS X 10.9 Mavericks. 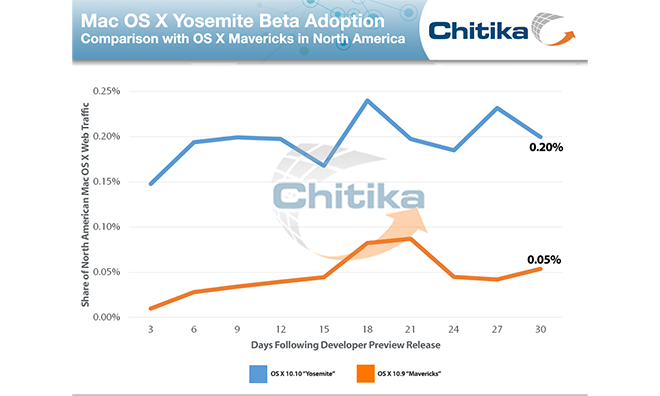 Chitika's research arm Chitika Insights published the new data on Wednesday, showing the relative adoption rates between Apple's upcoming Yosemite and the previous Mavericks. As seen in the chart above, Macs running the first OS X Yosemite Developer Preview accounted for 0.15 percent of all U.S. and Canadian OS X Web traffic just three days after the beta build's release on June 2. That figure jumped to 0.2 percent after a full 30 days in the wild. By contrast, Apple's Mavericks preview only managed to accumulate a 0.05 percent share of Web traffic after 30 days. The research firm believes Yosemite's long list of new features, continuity with iOS devices and a new iOS-inspired design fueled faster adoption. In particular, Safari feature additions and integration with Spotlight search could have fueled higher Web usage. Another possibility is Apple's OS X Beta Program, which lets members of the public join developers in testing pre-release builds of the next-gen operating system. Chitika notes the second bump in adoption, starting from day 15, was likely a result of Apple's second Developer Preview release, which brought a number of bug fixes to the operating system's so-called "continuity features." A third beta was issued on Monday, but falls outside of the study's purview. The cause of Yosemite's third rise in share seen toward the end of June is less clear, though the date corresponds with Apple's announcement that it has halted development of Aperture and iPhoto, effectively retiring the first-party photo editing software. The company plans to combine features from Aperture and iPhoto into a new "prosumer" title called OS X Photos, though the app won't be available until 2015.